Get the Special, EP, or Shirts by clicking here! The Gomers are in a rare position: Both in the same room at the same time. That’s because in less than a day the season culminates in the Sub-Five, 26.2 effort – and the guys have a lot to say about it. Thankfully they have the Gomernation’s feedback and thoughts to keep this, their final episode before the race, semi-organized. It does have a certain feeling of…well…ramdomness, let’s say. Maybe it has to do with the fact that Gomer2 almost killed Gomer1 last night. That’s not a joke. The most fun near-death experience ever. Join the Gomers as they share their thoughts, nervousnesses, excitements, and fears less than 20 hours from the big event. We’ll let you know how it goes, Happy Running! Best of luck with the marathon!! I don’t know if you’ll see this beforehand but… a sub-5 marathon equals 26.2 of our British pounds (= 43 USD) to the secular charity of your choice. Just listened to the episode. 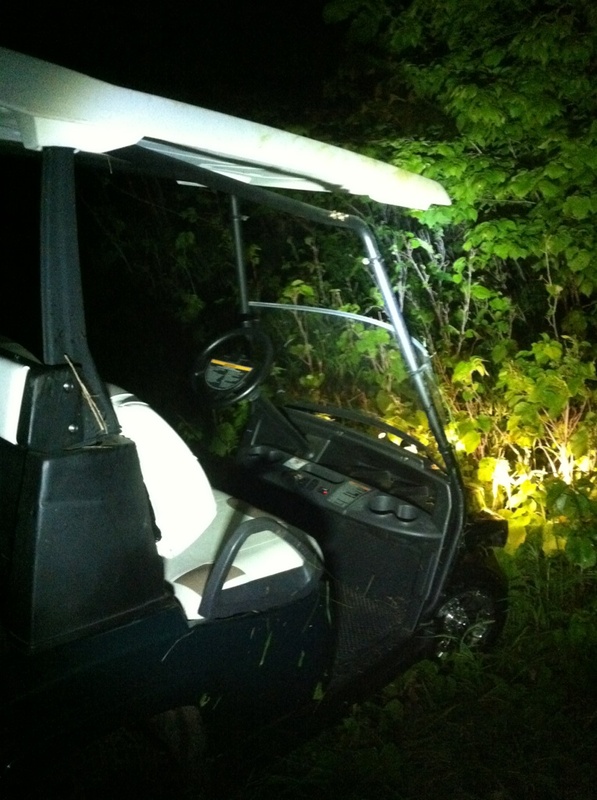 A souped-up golf cart? YOU IDIOTS!!! 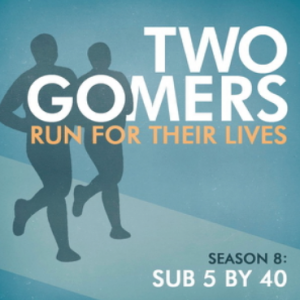 I forgot about Gomer 2’s foot – either Gomer doing it sub-5 qualifies for the donation. Ever notice that smile has a mile in it?? Congratulations on a great race. Don’t sweat the time. I didn’t want to say this before you guys ran your marathon, but last month when I ran mine I missed my time goal. By FORTY-FIVE minutes! My friends and family were wondering if I’d arrive in an ambulance. But no, I just ran my best and it wasn’t what I had planned. I didn’t miss one blessed workout for 16 weeks of training, either. I was aiming to qualify for Boston, which is a generous time for my age, and I just blew a kiss to the sky when my qualifying time came and went. How could I feel bad…I ran a marathon for heaven’s sake! That is something to celebrate. This year Ryan Hall didn’t meet his goal of winning Boston, but he looked mighty fine trying! Kara Goucher didn’t win either, but she promises to someday. Someday we’ll all get there. Until then, hip hip hooray for running your second marathon!